Alan Childs’ 25-year stint as faculty adviser to the men’s basketball team eclipses head coach Fran O’Hanlon’s tenure by five years. Call him the 16th man. 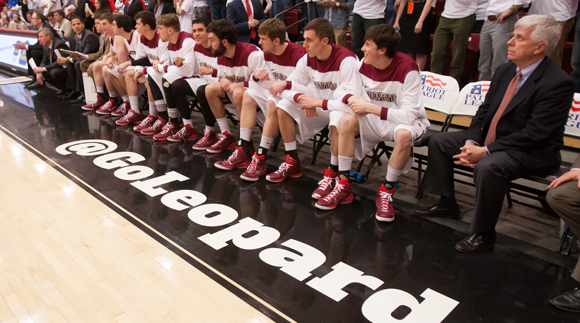 As the first and only faculty member to serve as academic adviser to the men’s basketball team, Alan Childs fills an important seat on the Leopard bench. “I’m sort of like a high-priced mascot,” jokes Childs, a professor of psychology and self-described “basketball junkie,” who was appointed to the position in 1990 after it was created by then head coach John Leone. He’s also the guy players seek out when they want to vent about not getting enough playing time—“My credentials come into play a bit there,” he says—or where to go for help with Calc 2. During his four years at Maryville College in Tennessee, Childs played baseball and says he understands the stress of being a competitive athlete while maintaining good grades. He’s also former director of the College’s Center for the Integration of Teaching, Learning, and Scholarship, so he knows a thing or two about pedagogy. “They make my job easy,” says Childs, whose 25-year tenure as faculty adviser makes him the most senior member of the men’s basketball program, surpassing even head coach Fran O’Hanlon’s 20-year legacy. Consider guard Joey Ptasinski ’15. In an interview immediately after winning the Patriot League title, the biology major said the only wrinkle in cinching a berth in the NCAA Tournament is that he’s going to have to reschedule a medical school interview that conflicts with Thursday’s game. This is Childs’ third time at the Big Dance, having accompanied the team to Boston in 1999, where it lost to Miami University, and to Buffalo in 2000, where it lost to Temple. As for the Leopards’ chances against the Wildcats, he says the team has a shot. “This team is a little unusual in that it’s so senior laden,” says Childs, who also served as the first executive director of the Patriot League (then called the Colonial League) from 1986-89. “When you have a member of the faculty who can serve as an ally and provide support, it was just natural having him on the bench, on the bus, and in the locker room,” says Leone, who now works in Lafayette’s Development Office as a gift officer. “It spoke to our priorities and it was good for the kids to see that. “I had no idea it would take off like it did,” adds Leone, noting that today all but one of Lafayette’s 23 athletic teams have faculty mentors, a nod to Childs’ pioneering example. Ben Freeland ’16 echoes that sentiment. A psychology major like his teammate Musters, Freeland says Childs is always willing to help players study on the road and provide direction when it comes to internships and graduate school. Categorized in: News and Features, The Real Deal: Real Students. Real Athletes.